The easiest way to check it is to start welding, full pedal and read the ammeter it will tell you the amps with those settings. If the tungsten balls welding steel, the polarity could be wrong, or possibly the machine is in AC. 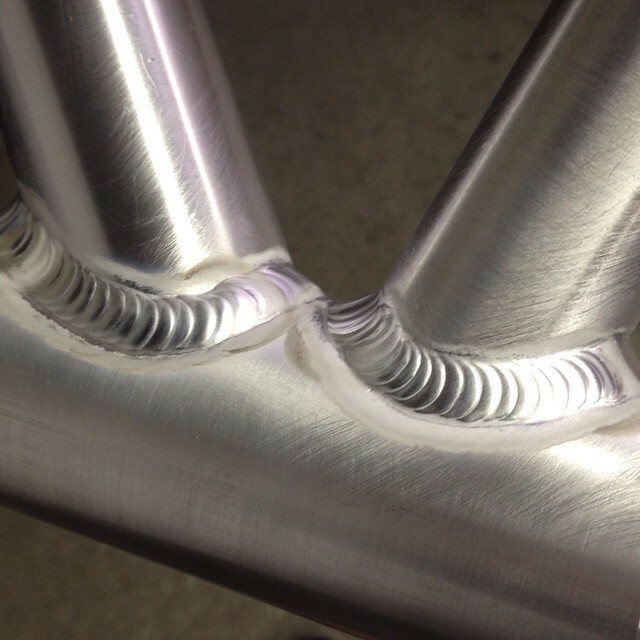 To Tig weld steel, the polarity needs to be DC, straight polarity. If the terminology is the same as the 300DX, "Peak" is the percent of time at the set current, and "Background" is the percent of set current for the remaining time. 30 amps 50% of the time. 17 amps 10% of the time. I appreciate the help. Although, I'm a bit confused. Regarding your average, where are you getting the 10%. In both "1" and "2" the background pertentage is the same. Based on the average you've calculated, are you saying that the background amps is determine by the difference in the "Peak" amp percentage time the "background" amp percentage which in the #2 scenario would be: 100% - 90% = 10% x 34 amps x 50% = 1.9 background amps???? is that how you're calculating back ground amps? I think you're confused about the terms. "Peak" refers to the percentage of time at peak current. In #1 that is 60 amps for 50% of the pulse. "Background" is the percentage of peak amps. So in #1, it's 60 amps for 50% of the pulse, then 30 amps (50% of 60 amps) for the remaining 50% of the pulse. In #2 it's 34 amps for 90% of the pulse, then 17 amps (50% of 34 amps) for the remaining 10% of the pulse. If you were to change the pulse frequency to 1 PPS, the #2 would be 34 amps for 0.9 seconds followed by 17 amps for 0.1 seconds . . .
To calculate average current it's: (90% times 34 amps + 10% and 17 amps) divided by 100%. Your right, I completely misunderstood the terms and their meaning. I understand now. I thought "Peak T" setting was establishing "Peak amps" which was a percentage of the Main amps determined by the "Peak T" setting. I realize now it's "the percentage of time at peak current". Thanks for your help and patients!!! Just for grins I set up the machine to the stated figures and the first read 45 amps the second set of figures was 33 amps. Using this formula below from "4sfed" didn't seem to work unless i was doing something wrong. "To calculate average current it's: (90% times 34 amps + 10% and 17 amps) divided by 100%". Last edited by Weldhelp; 06-24-2014, 07:28 AM. Both are equivalent by way of algebraic manipulation of common factors. I appreciate your efforts but I really wasn't trying to "use my mind's eye" to figure out why his equation didn't work. LOL! Last I checked via when my son's 5th grade math (pre algebra), "and" means to add. Also, using "my minds eye" I learned and understood the concepts of physics w/trig and calculus while still in high school prior to college. Just because a person is new to welding doesn't mean that they're in need of a 3 grade math lesson being prescribe by Mr. Rogers -- "...ok boys and girls now that you've had your milk and cookies, I need you to put your thinking caps on and use your mind's eye". 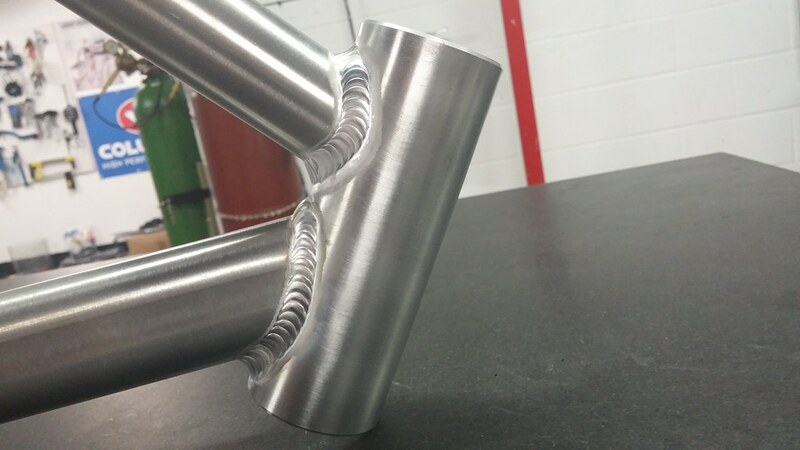 It is absolutely clear to me that 4sfed is a very bright intelligent highly knowledge person in the area of welding and beyond. I'm more than certain he understood where his formula was incorrect, but his point was made clear; therefore, he obviously didn't feel the need to further explain something so simple. I only pointed it out because I didn't want to cause further confusion for anyone else that may have been interested in the info. I wasn't in need of anyone explaining to me what he meant. 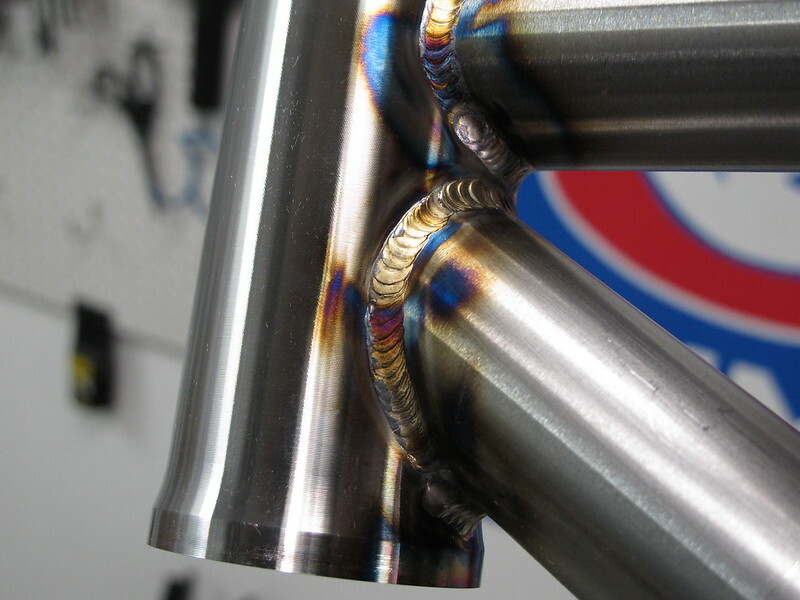 Nonetheless, do you have any "Process-Set up" info to share regarding your Tig projects. I realize you have a HTP 221 and not a Dynasty 200, 280, 300, or 350 (oh wait....did the HTP sales guy tell you to "just use your mind's eye and think HTP and not MILLER" -- JUST JOKING!!!! ). 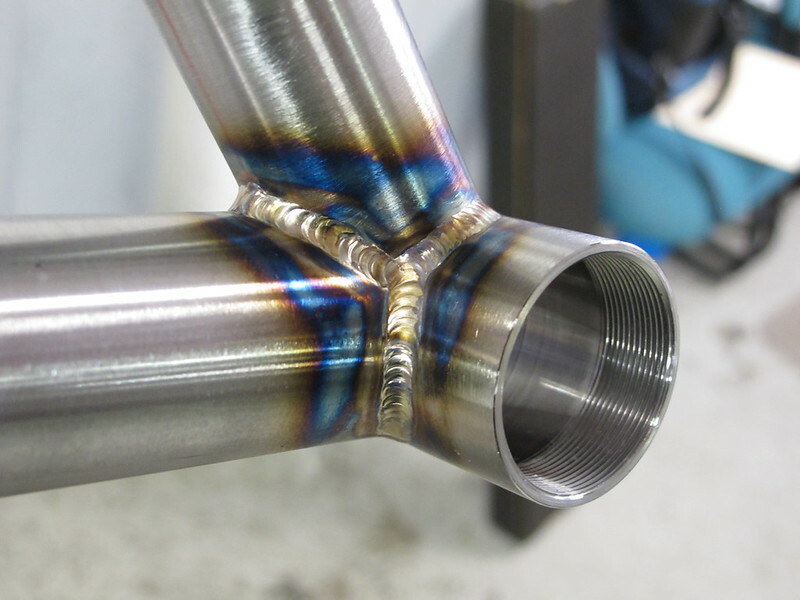 Nonetheless, I'm very much interested in knowing what pulse, ac, amp, and all other settings you're using to acquire specific arc characteristics necessary to complete specific weld types on specific materials. I'm trying to document as much of that as possible so that I have a good resource that I can use as a quick reference for starting points when I encounter something similar. Thanks Oscar Jr.! Again the HTP/"mind's eye" thing was just a joke and I hope you weren't offended!! Please share your info. Thanks!! Last edited by Weldhelp; 07-01-2014, 05:38 AM. I had to visit this discussion several times to see my typo . . . I could only "see" what I thought I typed. Thanks for the correction. Can anyone think of a reason I cannot get A/C Pulse to work with my Dynasty 200DX... I've tried about everything I can think of. I've had my 280DX for a couple of weeks now and figured I'd share some of my settings. 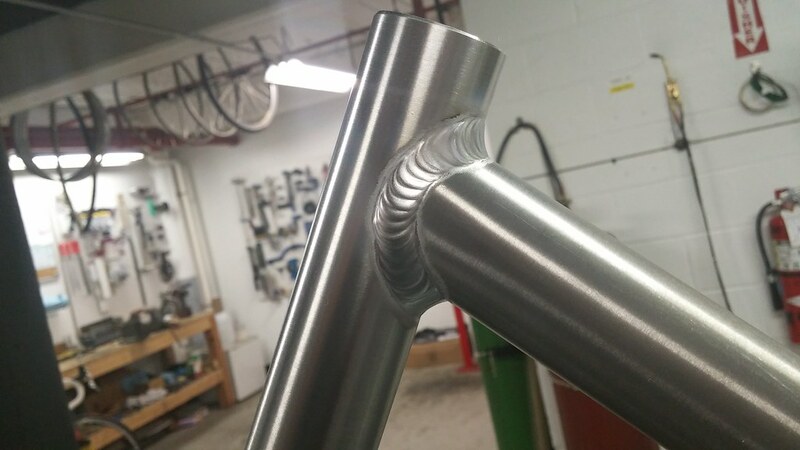 I build bicycle frames, so most everything I'm welding involves tubing. I have been loving the adjustability of the Dynasty. The control truly is remarkable. The first few photos and settings are on the AC side. 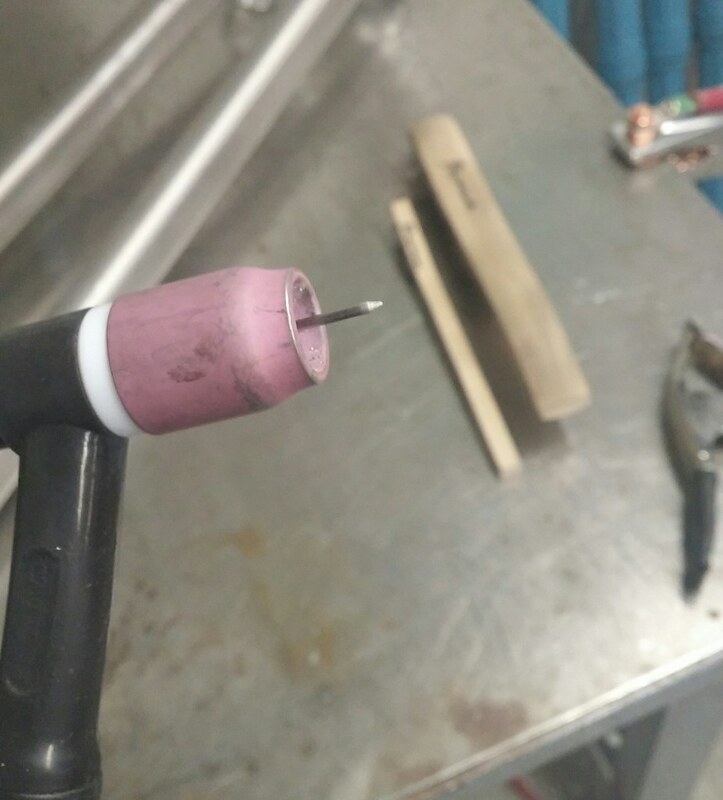 The tubing I'm using is 7005 and filler is 5183. The tubing seems to like the balance turned down a bit for a little extra cleaning. I'm running at 65-70% depending on the joint configuration. For frequency, I've settled in around 150 Hz. This seems to allow the toes to wet in really nice but still drive down into the root of the joint. I can always see metal flowing into the root. I have also settled into the soft squarewave for the most part. I like how the tri wave wets on the thin stuff, but I find it a little squirrely. The advanced squarewave seemed to bite in a little harder than I was used to. The Soft square feels really nice. 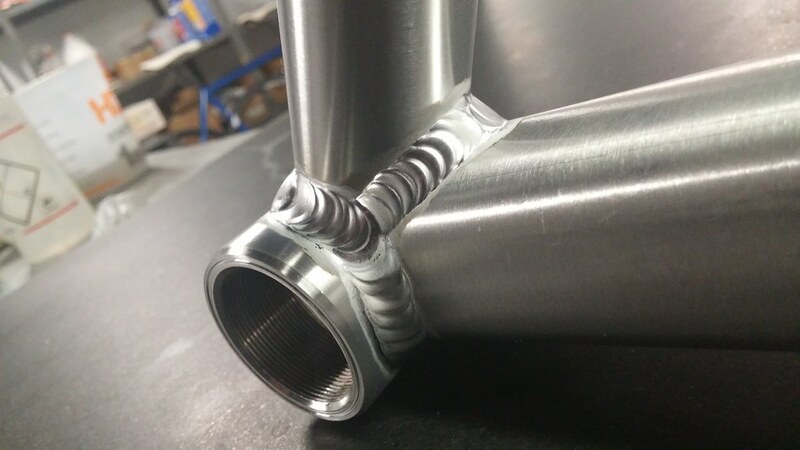 The head tube and threaded shell on this frame are 0.150" wall and the tubes range in thickness from 0.050" - 0.080". 3/32" DGP Tri-Mix tungsten, gas lens, #7 cup, 15 CFH. Machine set to 200 amps and controlled with the pedal. I also have been using the high speed pulse on DC and really like it. I really like how it gives a nice flat bead, toes that are washed in very nice, and a lot of control on tube edges. I was running 250 PPS, 40% peak time, and 25% background current on these. Anyway, I figured I'd pass along some of my settings in case it could help anybody out. Have fun! I've been doing some experimenting on my machine and wanted to share my findings in hopes that it might help some others. When I was in the process of deciding between the Dynasty 350 and Dynasty 280DX, one of the things that kept me coming back to the 350 was independently adjustable EN and EP amperage in AC. The 350 was a real reach for me financially though. When I heard that Miller was going to put out an expansion for the 280DX that implemented this feature, I decided to go with the 280DX and wait it out for the expansion. First, a quick overview of what this feature actually is. Most weldors are familiar with balance and frequency adjustment. Balance is the percentage of time that the machine is on the EN or EP side of the wave during each cycle. Frequency is the number of cycles per second that the machine is cycling. 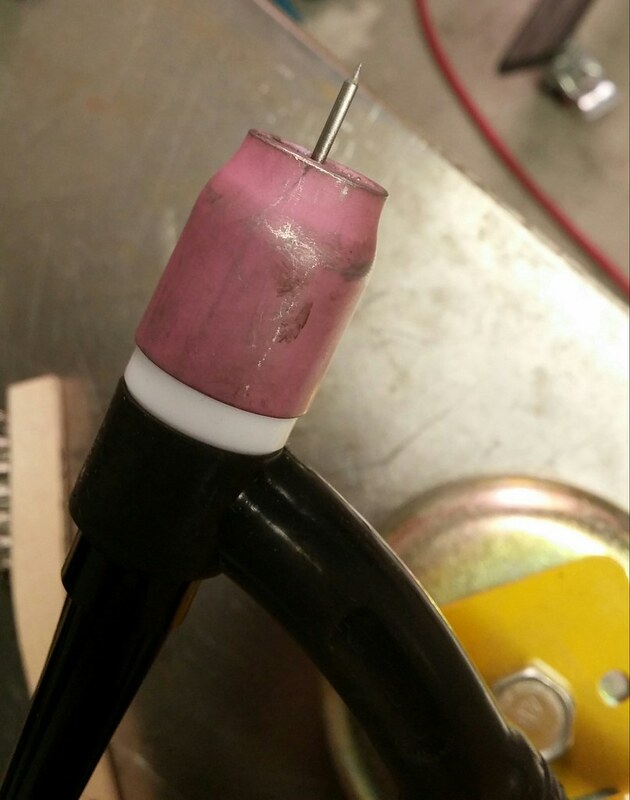 So if you are running 75% EN balance and 120 Hz, the machine is spending 75% of the the time on the electrode negative side of the cycle and 25% of the time on the electrode positive side of the cycle and it's switching 120 times per second. By introducing independently adjustable EN and EP amperage, you can dial in the amps on each side of the wave. For instance, you might run 125 amps on the EN side and 100 amps on the EP side. The common approach and what most of the machine manufacturers recommend is running higher EN amps than EP amps to put more heat into the part for deeper penetration and less heat coming back into the tungsten. When I got the expansion for my machine, I started off by going with Miller's suggestion. I started off with a ratio of 1.5/1.0 EN/EP. In other words, the EN amperage was 1.5 times greater than the EP amperage. The results were not what I was expecting or hoping for. I found I had to turn my balance down to get enough cleaning and that resulted in more tungsten degradation than I was used to (I was running a 3/32" 2% lanthanated). It got me thinking about what is actually going on during the EP cycle and what is really doing the cleaning. Did it have more to do with the amperage or the % balance? I started experimenting with running the EP amperage higher than the EN amperage to understand if it improved cleaning. I was really surprised to find that for my application, the amperage on the EP cycle played a more significant role in cleaning than the time (balance did). I started pushing the limits a bit, and went as high as a 1.0/1.5 EN/EP ratio and a balance of 85-90% EN. Yes, the EP amps were 1.5 times greater than the EN amps. 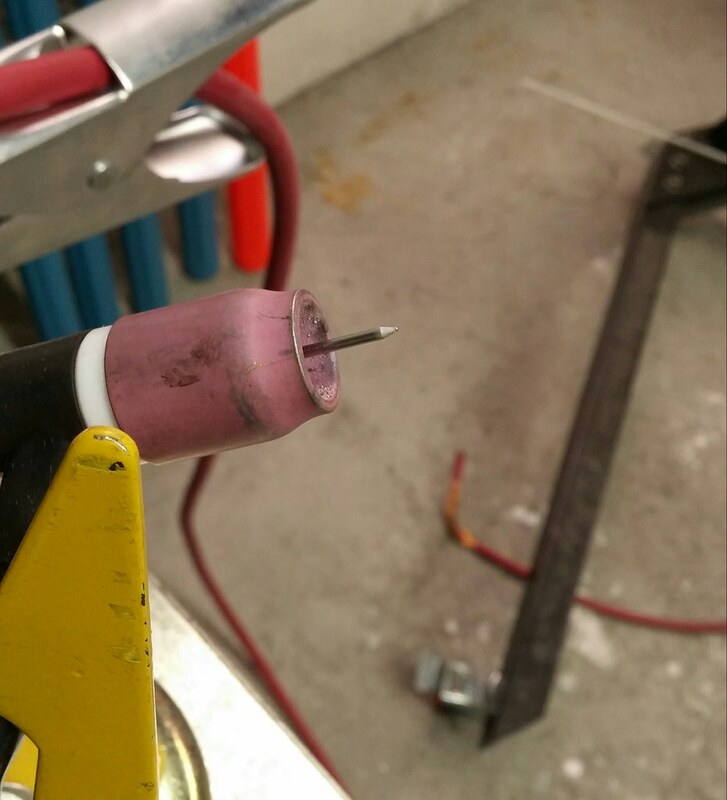 I was able to go down to a 1/16" 2% lanthanated electrode ground to a sharp point. The resulting control was really shocking. It's been as close to feeling like running DC on steel as I've been able to dial in yet. I also found my restarts looked a little nicer and the etching zone was narrower and more faint. In my business, weld aesthetics sells. It really matters. I'm really happy with how the finished product is looking. Here, I have my EP amps set at 280 amps and my EN amps set at 195 amps. Wave shape was advanced square wave for both EN and EP. My balance was set at 80-85% EN depending on the joint. 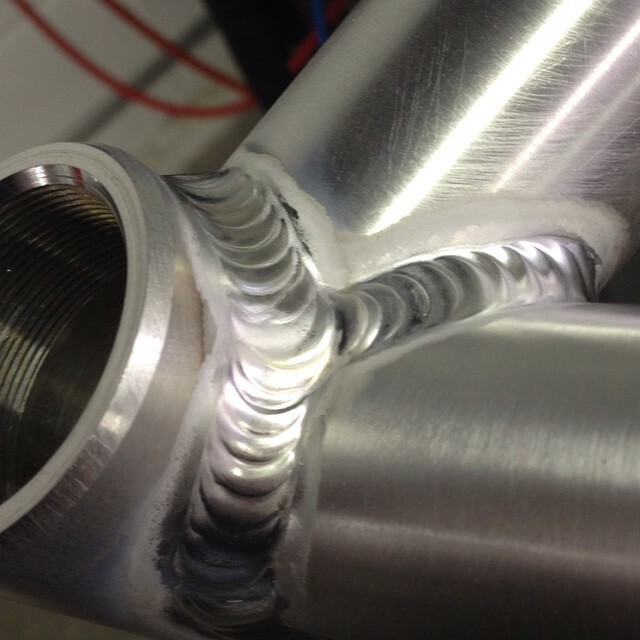 Welding the sides of the tube goes a little nicer with a bit more cleaning compared to the deeper angles. Frequency was 250 Hz. Running a CK20 torch with a gas lens and #8 cup running at 18 CFH. Here's the initial prep on the tungsten. 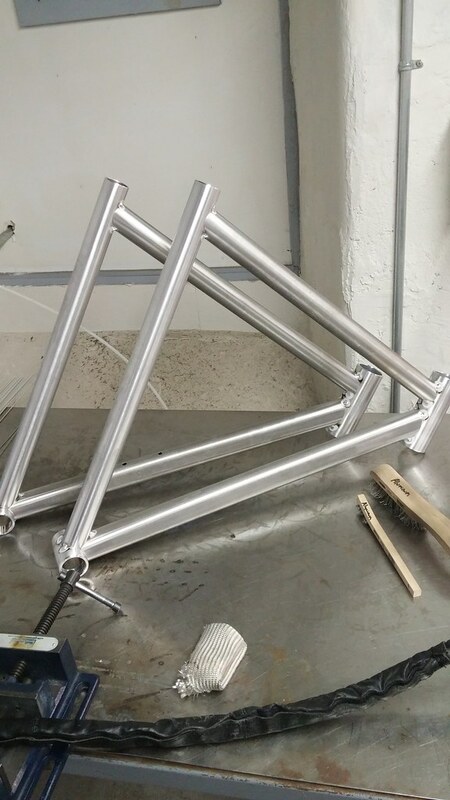 Here's the tungsten after tacking the two front triangles.